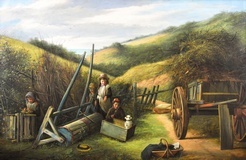 William Joseph Shayer was born on 2 April, 1811 the eldest son of William Shayer Senior (1787-1879) and his first wife Sarah Earle. 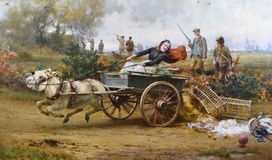 His brothers Edward Dasherwood Shayer (1821-1864), Henry Thring Shayer (1825-1894) and Charles Walker Shayer (1826-1914) also became painters. 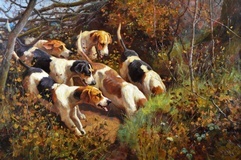 He was taught by his father and at times assisted him in his studio at Bladon Lodge, Southampton. 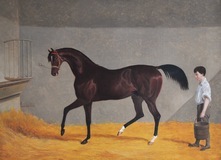 He showed an early talent for painting horses and started exhibiting in 1828 at the age of 17. 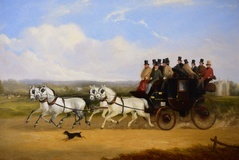 After moving to Holborn around 1833, he earned his living as a coach driver to supplement his income, which had a direct impact on his subject matter and he began producing coaching scenes. 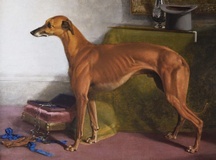 He exhibited at the Royal Academy from 1829, the British Institute and the Royal Society. 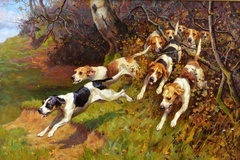 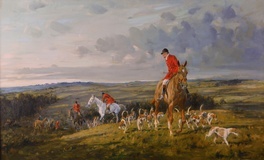 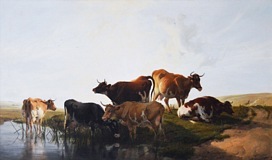 Shayer also painted sporting and hunting scenes as well as a number of farmyard scenes, however it is for his highly accurate paintings of coaches that he is perhaps best known. 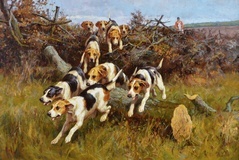 Examples of his work are held by the Glasgow Museum, Leicestershire Museums, Orleans House Gallery and the Russell-Coates Art Gallery.